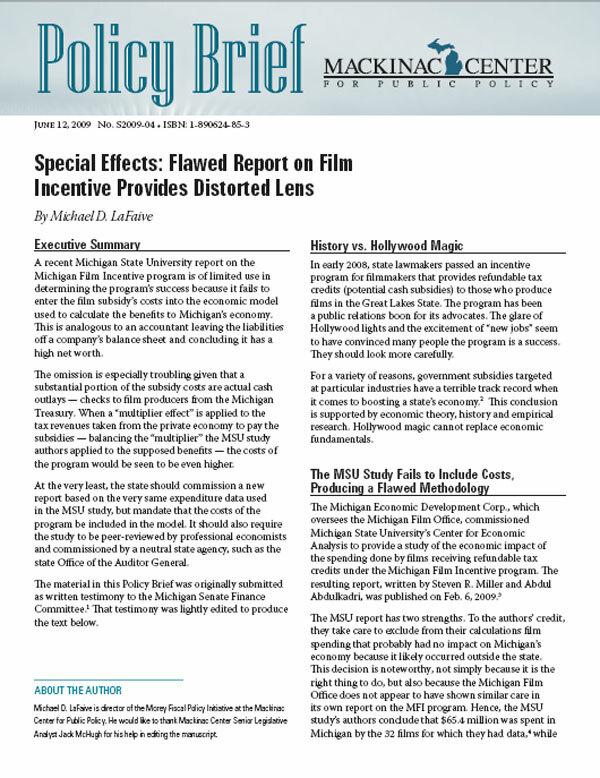 A recent Michigan State University report on the Michigan Film Incentive fails to enter the film subsidy’s costs into the economic model used to calculate the benefits to Michigan’s economy, according to a new study by Michael D. LaFaive. Imagine that an accountant hired to do a company's books examined its sales revenue but ignored its expenses, and so concluded that the firm was doing great. Then, the company's management used the obviously flawed audit to boast to stockholders that their controversial business model was a huge success. That's a fair analogy for what happened last February when the Michigan Economic Development Corp. paid Michigan State University to analyze a controversial film subsidy program that covers up to 42 percent of the expense of films shot in this state. MSU economists counted the number of Michigan residents hired by studios, assumed a "multiplier effect" resulting in even more jobs, and declared the program a rousing success. How many jobs would have been created but for the excessive burden a 22 percent Michigan Business Tax surcharge imposes on every other employer, some of which goes to out-of-state film producers? The study should be redone with the program costs included, peer-reviewed by professional economists and commissioned by a neutral agency, such as the legislative Auditor General. Despite this study's obvious flaw, MSU issued a glowing press release lauding the film subsidies, which most media outlets uncritically passed on to the public. 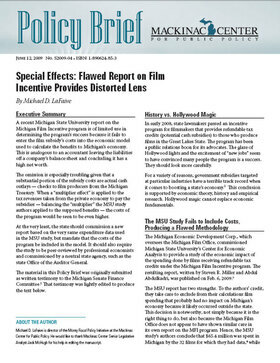 The Film Office even attached the MSU study to its own annual report (the state Attorney General later confirmed that the Film Office report violated the subsidy law's disclosure requirements). In the private sector analogy above, managers who delivered that sloppy audit to shareholders might expect a visit from the DA's fraud squad. The accountant would probably face competency hearings at the very least. Were this a high-profile enterprise that had been much ballyhooed by the press, the misleading of shareholders would likely generate scornful headlines. In this instance those duped "shareholders" are Michigan taxpayers, and there has been no outpouring of journalistic outrage. There should be. Studies like the one MSU produced are a regular feature of this state's "economic development" bureaucratic empire. For example, the Michigan Economic Growth Authority commissions similar (if more responsible) reports to show the "multiplier effect" of discriminatory business tax breaks granted to particular firms it selects. All these studies use an economic software "model" that supposedly quantifies how a new plant employing 50 or 100 workers, for example, generates "spin-off" or "indirect" jobs from other employers. For the film subsidies, those indirect employers may include caterers who supply food to film locations, hotels where visiting actors stay and carpenters who erect movie sets. To the credit of the MSU economists, they did not rely on the hyped-up figure of 2,800 "direct" jobs promoted by the Film Office itself, recognizing that these were temporary gigs amounting to just 254 full-time jobs if "annualized." The MSU authors also used a more plausible estimate of how much subsidized producers spent in Michigan — $65 million — instead of Film Office figures that count money spent in other states. However, like the accountant in the analogy, they left out the $48 million cost of the subsidies in 2008. As mentioned, an undisclosed but significant portion of that was actual cash outlays — checks written on the account of John and Mary Michigan Taxpayer. A fair accounting would not only include those costs — that's really a no-brainer — but would apply a "multiplier effect" to them as well. For example, how many jobs would have been created but for the excessive burden a 22 percent Michigan Business Tax surcharge imposes on every other employer, some of which goes to out-of-state film producers? Unlike the accountant, there are no "Generally Accepted Accounting Principles" for university economists producing analyses justifying discriminatory state tax breaks and subsidies. Nothing requires them to enter all the pertinent information in economic software models that even when used properly yield an unwarranted illusion of precision. This makes it hard for residents and policymakers to critique job projections based on them. Similarly, no Securities and Exchange Commission regulations mandate honesty and integrity in the self-serving reports and press releases issued by government economic development agencies. Those institutions are free to be as sloppy and self-serving as they choose. Michigan taxpayers are free to draw their own conclusions regarding how well they're being served by each. Michael D. LaFaive is director of the Morey Fiscal Policy Initiative at the Mackinac Center for Public Policy, a research and educational institute headquartered in Midland, Mich. Permission to reprint is hereby granted, provided that the author and the Center are properly cited.